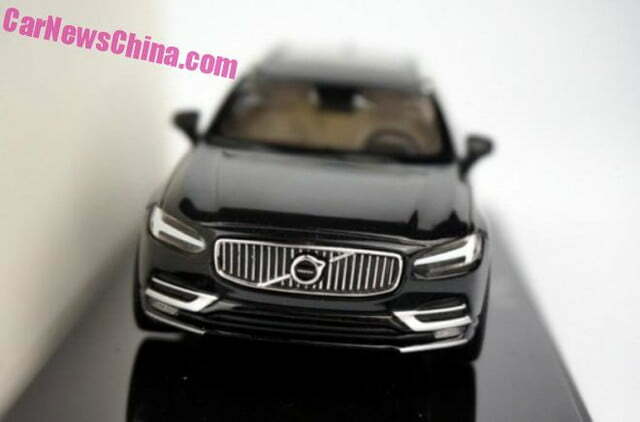 Volvo is having a difficult time keeping its new models under wraps until their official debut. 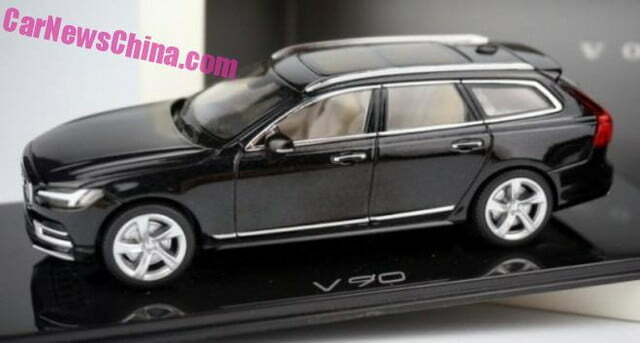 1/43-scale models stolen from toy manufacturer Norev recently revealed the upcoming S90, and now a model built by the same company has given us an early look at the V90 station wagon. 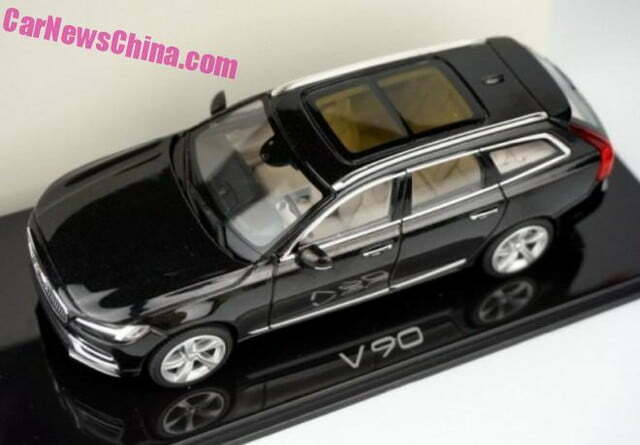 Published by CarNewsChina, the pictures confirm that the V90 is all but identical to the S90 on which it is based from the front bumper to the B-pillar. That means it boasts an elegant-looking front end characterized by a large grille with chromed vertical slats, and swept-back headlights with integrated T-shaped LED daytime running lights, a styling cue that Volvo has christened Thor’s Hammer. Around back, the wagon stands out from the sedan thanks to a roof-mounted spoiler and large, hockey stick-shaped tail lamps that are visibly inspired by the ones found on the stunning Concept Estate shooting brake that was presented last year at the Geneva Motor Show. The interior is expected to be standard S90 fare, but that’s not a bad thing because Volvo’s next sedan is shaping up to be its most luxurious yet. Look for the V90 to offer ample space for five passengers and their gear in a spacious, well-lit cabin built using upscale materials. The bulk of the wagon’s navigation, connectivity, and entertainment functions will be grouped in a state-of-the-art infotainment system controlled by a large tablet-like touch screen that takes up most of the center console. 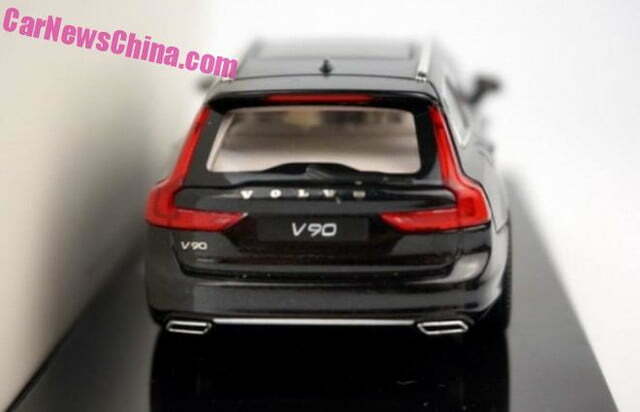 The V90 will ride on the same Scalable Platform Architecture as the second-generation XC90, and the two models will share a long list of mechanical components. That means the wagon will launch with a 2.0-liter four-cylinder engine that generates 316 horsepower at 5,700 rpm and 295 pound-feet of torque from 2,200 to 4,500 rpm thanks to the use of both a supercharger and a turbocharger. The four-banger will spin all four wheels via an eight-speed automatic transmission. Other powertrain options, such as a fuel-sipping turbodiesel four-cylinder and a 400-hp plug-in hybrid drivetrain, will be added to the V90 lineup a little later in the production run. 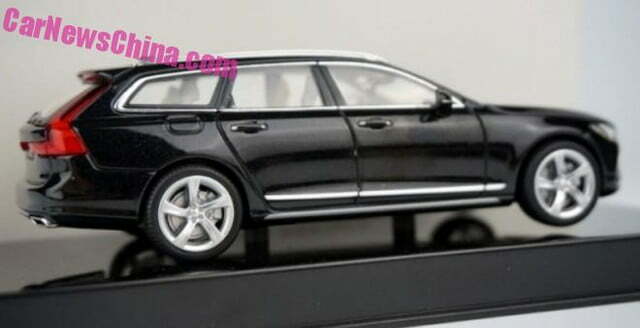 Volvo is expected to reveal the life-sized V90 before the end of the year. It will go on sale across Europe next year, but whether we’ll see it in the United States — where the wagon market is steadily shrinking — is up in the air.